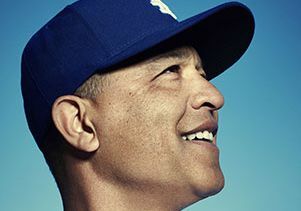 Dave Roberts, UCLA's all-time leader in career steals when he was a student in Westwood, is making history as the first minority manager for the Los Angeles Dodgers, the youngest hired by the franchise since 1954. It is, Roberts says, "the opportunity of a lifetime." In 2004, the Boston Red Sox trailed their archrivals, the New York Yankees, three games to none in the American League Championship Series. No team had ever come back from that kind of deficit, and now — down a run heading into the ninth inning of game 4 — a potential Sox comeback meant overcoming New York’s legendary closer Mariano Rivera, as well as the weight of an 86-year World Series drought. Boston’s Kevin Millar led off the ninth with a walk. Enter Dave Roberts, pinch runner. Sent in to run for Millar, Roberts represented the tying run. With Rivera’s first pitch, Roberts broke for second, beating Jorge Posada’s throw to Derek Jeter. Now and forever known as “The Steal,” Roberts’ bold base-running jump-started a rally that saw him scoring on Bill Mueller’s game-tying single. The Red Sox won game 4 in 12 innings, took the next three from New York, then went on to beat St. Louis in the World Series. Fast-forward to 2015. 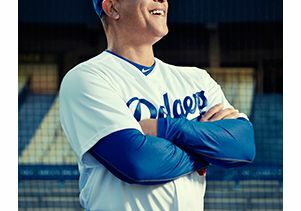 When the Dodgers decided to replace manager Don Mattingly during the off-season, they sought a strong and experienced leader, an energetic presence who could connect with players and whose teams would do the little things to win — like steal a base in the bottom of the ninth with the season on the line. Enter Dave Roberts, manager, Los Angeles Dodgers. 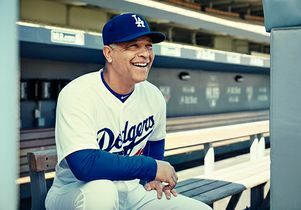 Roberts’ appointment as Mattingly’s successor made its own kind of history, with the franchise that made Bruin Jackie Robinson the first black player in Major League Baseball hiring its first minority manager. Roberts’ father is of African-American descent; his mother is Japanese. The new skipper recognizes that his background links him to a cross-section of Dodger fans on both sides of the Pacific. 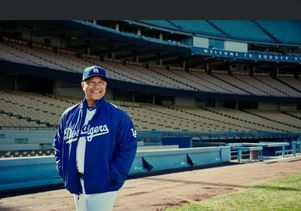 “For me to be the first Japanese manager for the Dodgers, I think there’s a lot of excitement over there. I’ve talked to relatives and know how excited [Japanese fans] are, and now that we’ve signed [Japanese pitcher] Kenta Maeda, the energy and excitement for Japanese culture and the Dodgers continues to build,” says Roberts, a one-time Dodger teammate of pitcher Hideo Nomo. At his inaugural press conference as manager, Roberts used words like “grit” and “grind” when describing what he looked for in a team and its players. These are old-school baseball terms, intangible qualities that seem almost in opposition to the unemotional analytics pervasive in the game today. Roberts sees no inconsistency. “Ultimately, the goal is to win or produce a certain amount statistically. But at the core, if you’re focused on being accountable to yourself, I think that the grinding mentality — the head-down, blue-collar mentality — goes along with the metrics,” says Roberts. Eric Karros has a unique perspective on the hire. A fellow Bruin, one-time Dodger and now a broadcaster for Fox Sports, Karros calls the move “a good hire — maybe not a conventional one for a veteran team, but one that you can understand, given the structure of the front office, the philosophy,” he says. Neither Walter Alston nor Tommy Lasorda, two iconic managers, had managing experience at the big-league level prior to taking the reins of the Dodgers. Roberts’ approach to managing the day-to-day machinations of a baseball team starts with acknowledging the sheer length of MLB’s 162-game season. That’s where the “grind” comes in. “I’m an emotional person by nature, but I think that as a manager — given the ups and downs, the ebbs and flows of a Major League Baseball game, let alone a season — I’ll try to keep things somewhere in the middle,” Roberts says. Roberts almost didn’t play for UCLA. The son of a Marine, he had an appointment to the Air Force Academy but decided he wanted a “regular” college experience instead and met with baseball coaches, including UCLA Head Coach Gary Adams, late in the summer after graduating from high school. With no scholarships left to give, Adams offered Roberts a spot as a walk-on. Roberts says he decided that, at worst, “I’d have a great education from UCLA.” He ultimately earned a degree in history and learned an important lesson from Adams. Karros believes Roberts’ positive people skills will be critical. One of the things that appeals to Roberts about returning to Los Angeles is his proximity to the campus he once called home. It gives him a chance to pay closer attention to the UCLA program. 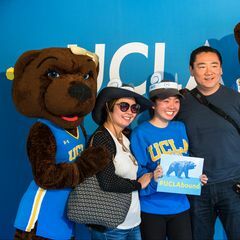 This story has been adapted from one posted on the UCLA Magazine April 2016 website. Roberts, UCLA's all-time leader in career steals, is making his season debut as manager of the Los Angeles Dodgers. Roberts, a 10-year Major League Baseball veteran, is the youngest Dodgers manager hired since 1954. 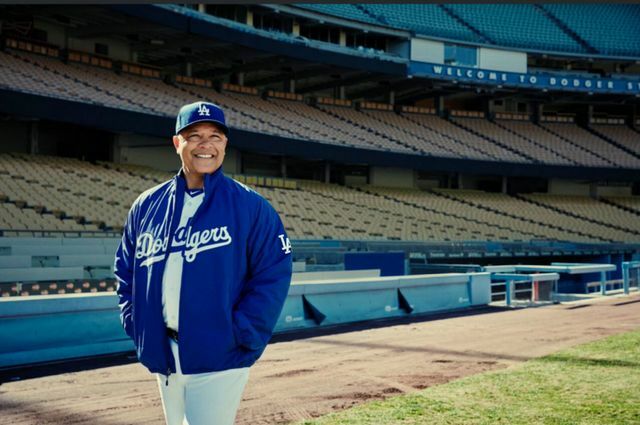 Roberts is the youngest Dodgers manager hired since 1954. Roberts is the new manager of the Los Angeles Dodgers.